A heavy-duty double-column bridge mill and its 90-tool automatic changer allows this Minnesota tool builder to keep machining inhouse, giving it control over process quality and lead time. World-class on-time-delivery and quality numbers are directly related to an evolving computerized value-chain system that can automatically process as many as 5000 customer-demand changes daily across 6000 part numbers, and adjust schedules and supplier deliveries to match. Much more than merely machining technology, the 2016 edition of IMTS, a 1.3-million-sq.ft. 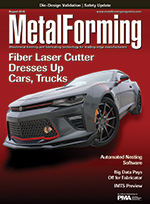 behemoth of a manufacturing tradeshow, offers up breakthrough developments in automation and robotics, fabricating equipment, software and additive manufacturing.